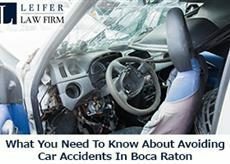 The vast majority of car accidents in Boca Raton are caused by driver error, which means that there are things every driver can do to help avoid another car wreck. Driver error is a catchall word that refers to behavior such as speeding, distracted driving, unsafe lane changes, and following another vehicle too closely. But by modifying your actions when you are on the road, you can avoid putting yourself in a situation that could create a car accident. Your blind spot refers to the area that you can’t see in your vehicle’s rear-view or side mirror. Many drivers make the mistake of attempting a lane change by relying solely on their mirrors. But to avoid getting into a car accident in Boca Raton, you have to look over your shoulder prior to making a lane change to ensure that you detect any vehicles that are driving up right next to your vehicle. These vehicles are often in the blind spot and if you don’t turn your head…or buy a vehicle with built-in blind-spot detectors, you may hit a car as you make your lane change. Rear-end car accidents are very common, and one of the biggest reasons is that too many drivers follow vehicles in front of their own cars far too closely. Avoid this problem by ensuring that you are at least a car length behind the vehicle in front of yours. This gives you enough time to apply the brakes if the driver in the car in front of you does something unsafe or is forced to brake due to an unexpected occurrence. Keeping one car length between you and the vehicle in front also allows you to make a safe change if the car ahead of yours brakes abruptly. One other risk of tailgating is that the driver in front of you will often tap his or her brakes continuously as they become aware that you’re following too closely. This type of braking can throw off your instincts and trigger behavior that can cause an accident. Practicing safe driving techniques can be an effective way to avoid a car accident, but the truth is that you can’t account for every mistake that others make, which can result in a car wreck. And after you’ve suffered injuries in an accident, the first thing you should do is secure the services of an experienced personal injury firm, such as the team at Leifer Law. Our job is to take care of the all the legal issues so that you can focus on healing and recovery. Give us a call today at 561-660-9421 for a free legal consultation.